I enjoyed the Windows-based Transformer Book T100 I tested a few months ago, so I was excited to see how its Android-powered sibling would stack up. The engineers at Asus engineers have now proven themselves to be pros at designing 2-in-1 tablet/laptop hybrids running in both Windows and Android flavors. But the names they’ve chosen for these two devices are telling: The Windows device conjures the image of a notebook, while the Android device evokes the iPad. 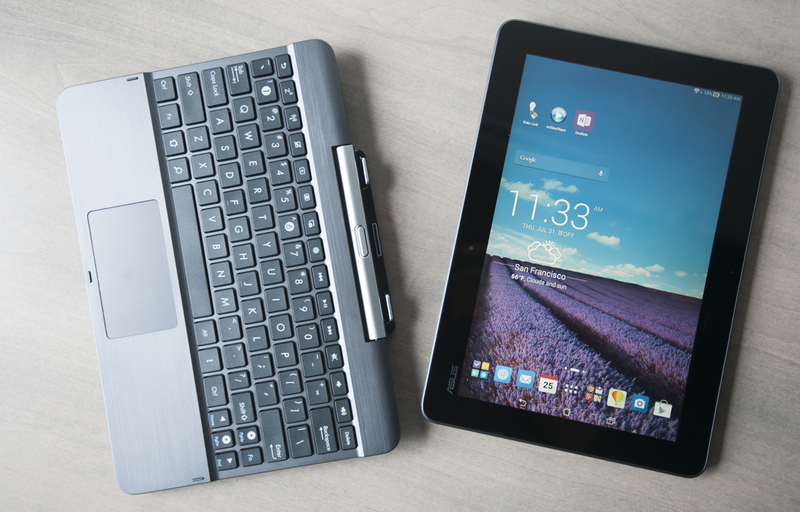 The Asus Transformer Pad TF103C might look like a small Windows 2-in-1 notebook, but it runs the Android OS (KitKat). The Transformer Pad TF103C is an interesting mix of what Asus has learned from working both sides of the OS fence. It’s based on an Intel Bay Trail-class processor—the quad-core Atom Z3745—that’s more commonly found in Windows machines (Android devices are more typically powered by ARM chips). The Android OS (Android 4.4, aka KitKat in this case) can live comfortably in 8GB of storage, and it runs well with just 1GB of RAM, which is what the TF103C has. Windows needs at least 4GB of memory and 32GB of storage—and even then you’ll feel pinched when you go to install application software alongside it. I found the trackpad to be surprisingly useful with Android apps. 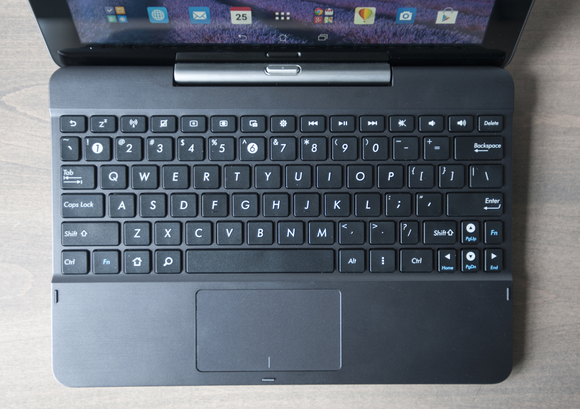 Using the lightweight OS enabled Asus to cut back on RAM and storage, dropping the device’s street price to a wallet-friendly $299—including the keyboard dock. This Transformer feels like so many earlier models in this product family. The tablet half is pleasantly curved, with a soft-touch backing that feels great in your hand. It’s slimmer than earlier incarnations—measuring just 0.4 inches thick—and weighs in at only 1.2 pounds. The main difference between the Android-based TF103C’s 10.1-inch display and the same-sized display in the Windows-based TF100 is that the Android tablet’s screen has resolution of 1280x800 pixels, where the T100’s screen delivers resolution of 1366x768. I’m a fan of vertical pixels, especially in the context of productivity, so the TF103C has the advantage here. The screen also gets both very bright and very dim, making this bedtime reader happy. Both machines come in at an identical 2.4 pounds with their keyboard docks. That’s a good carrying weight for a 10-inch laptop, although the T100 has the option of a dock with a hard drive inside if you don’t mind the extra bulk. The Transformer Pad has but one USB port, and it's on the keyboard half of the product. Being an Android tablet, the TF103C doesn’t have as many I/O ports as you’ll find on a Windows laptop. There’s micro USB for charging and a microSD card slot additional storage. You’ll need to attach the keyboard to get a full-size USB 2.0 slot. Media capabilities include a headset jack, stereo speakers, a rather low-res (0.3 megapixels) front-facing camera, and a 2MP camera on its back. The TF103C supports 802.11a/b/g/n Wi-Fi, Bluetooth 4.0, and Miracast (for wireless video streaming to displays that support that standard). 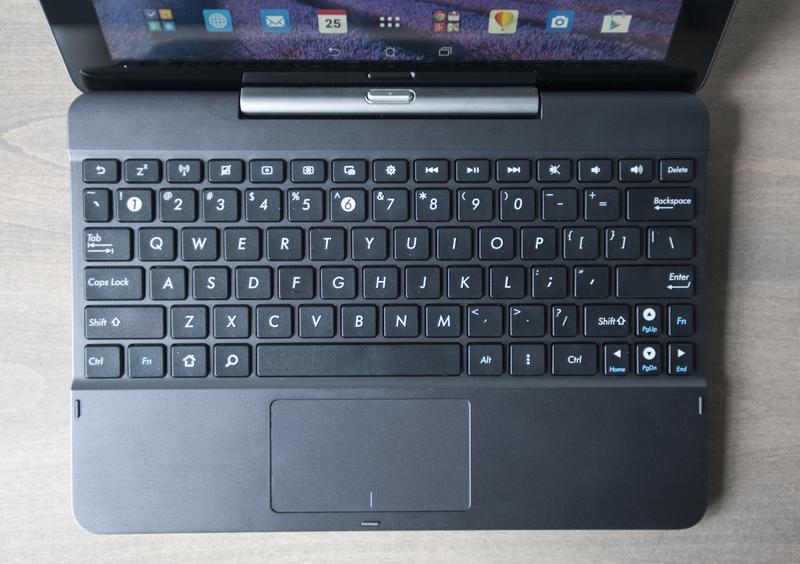 The keyboard dock is comfortable to type on, with keys that are as well-spaced as they can be for a 10-inch device. I found the trackpad surprisingly useful with Android. As touch-centric as that OS might be, it’s sometimes easier to move your finger to the keyboard deck than to reach across the keyboard to stroke the touchscreen. Function keys are more specific to the OS and are moderately useful as such. The Intel Atom processor gives the TF103C an advantage over other Android tablets that we’ve tested recently, beating both the Lenovo Yoga 10 and Dell Venue 8 in our benchmark tests. 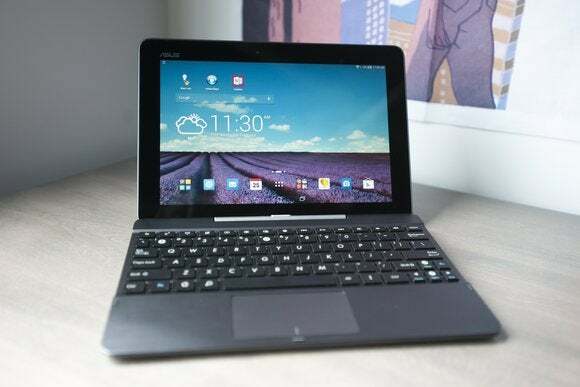 The Asus’s 6-hour and 58-minute run time is on the short side for Android tablets, and it’s far short of the 11 hours the Windows-based Transformer Book T100 delivered. This is where things with the TF103C started to break down for me. Despite having an iPad, an Android tablet, an Android phone, one or another Linux device, and several MacBooks in my past, I’m pretty entrenched in the Windows world when it comes to getting stuff done. I have several programs I use that are still either Windows-only, or they've only just recently been ported to Android. For example, I do most of my writing in Microsoft’s OneNote note-taking software. Using the OneNote Android app was not a smooth experience. Clicking and dragging on text does not highlight it. I had to reach up and hold my finger on the screen, then push the cursor around to highlight text. I tried to switch over to Evernote, which works much better on the TF103C, but not with my workflow. If you’re an Evernote user, you’ll be quite happy working in the Android app on the Transformer, especially with the solid keyboard. The Chrome web browser is pre-installed, but I found that many of the sites I frequent either rendered much more slowly, or defaulted to the mobile versions. You can use bookmarks to make sure the right versions load, but the slow loading will be more problematic. Feedly has a wonderful mobile app that's great for reading news on my phone, but I found it too awkward when scaled up to tablet size. I had to reach up and touch the screen to scroll versus using the keyboard shortcuts I’m used to in the browser. Android is a touch-centric OS, but the Transformer Pad's trackpad proved to be surprisingly useful. I had to abandon some other Android apps that I love to use on my phone, because they just don’t play nicely with tablet-sized devices. I found myself just giving up on the keyboard for browsing and navigating certain apps, choosing instead to pick up the tablet and just use it on the couch rather than pretend I had a laptop. Which lead to the next issue: The onscreen keyboard is terrible. Perhaps I’m just too used to the Windows 8.1 keyboard or the iPad keyboard at this point, but I really struggled with it. The Transformer Pad TF103C is a solid tablet for entertainment and other casual uses, but it won't supplant a true notebook if you're looking to boost your productivity while you're on the road.